Safety is part of our culture; it’s integral to the way we do business and not just a set of rules we follow. We live and breathe by our Safety policy of: Think Safe. Work Safe. Go Home Safe. So, providing a safe workplace for our staff is our goal, achieved by working with you to minimise safety risks onsite and our continuous stringent training. From day one, our Workplace Health and Safety Manager, and our labour managers, work with you to ensure the safety of our workers on your project site. And, when you move to a new project site we’re happy to conduct at worksite safety assessment to identify likely risks and to provide solutions to mitigate them. These initial inspections are followed up by regular site visits by our labour managers. We run a number of training programs to ensure our workforce is equipped to identify and handle any situation and increase the safety of your worksite. You can have peace of mind that all of our staff are well trained in workplace health and safety measures, have the required skills and certificates, and arrive wearing the correct safety gear, every day, until the job is done. BriX Projects’ workplace health and system is certified against safety standard AS/NZS 4801:2001. 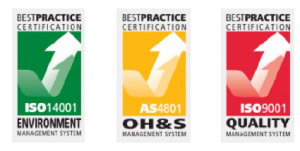 To ensure we maintain this certification, our Workplace Health and Safety Manager regularly audits the system and every six months it is audited by an independent third party. This demonstrates our commitment to continuous improvement in safety, reducing the likelihood of accidents occurring and the time and cost involved in downtime. This gives you peace of mind so you can get back to work and let us focus on improving the safety-focus and skills of our workforce. When you choose our skilled and experienced tradespeople and construction workers for your next project, rest assured you’re in completely safe hands. For more information on our safety policy please contact info@brixprojectslabourhire.com.au. Souring reliable permanent and contract professionals and tradespeople across multiple industry sectors for both short and long-term projects. Hire skilled construction labour for your commercial and residential projects including new developments, alterations and renovations, and repair and maintenance work. We’ve increasingly developed a reputation as a supplier of choice for delivering contingent track labour to some of Australia’s largest participants in the rail industry. Our team is an expert in this field, backed by many years’ hands-on experience in the sector. We've developed strong working relationships with some of the leading contractors/sub-contractors in Australia, who rely on us to consistently supply skilled electricians for new & on-going projects. Proven track record in supplying highly qualified, reliable & professional workers integrating seamlessly with our client’s teams onsite, achieving fantastic results for some of the largest & most challenging civil construction projects. Delivering mobile workforce solutions for both open-cut and underground mining operations. Our experienced mining tradespeople have the industry knowledge to understand your unique requirements.